Pressrelease: The Bureau of Piracy (Piratbyrån) denounce responsibility for the internet attacks! THE BUREAU OF PIRACY (PIRATBYRÅN) DENOUNCE RESPONSIBILITY FOR THE INTERNET ATTACKS! The last days authorities and other institutions homepages has suffered from DDOS attacks. Piratbyrån declines involement in this type of destructive actions. - Attacks of this sort which we have seen here is not only attacks against individual homepages, it is an attack of the internet as a whole, says Marcin de Kaminski from The Bureau of Piracy (Piratbyrån). It is not a worthy reaction to what have happened the last couple of days. The Bureau of Piracy (Piratbyråns) activities is building on an advocate for communication, information exchange and a free internet. Therefore we are very worried about the fact that our homepage, toghether with many others, got shut down the way they did. We encourage everybody that would like to help us, the Pirate Bay and other affected to report the wednesdays police actions to JO (a political representative). We also encourage the affected to demand thier servers back, and to demand compensation for possible loss of hardware, information and income. - If you want to help The Bureau of Piracy (Piratbyrån) you do best so by continuing using the internet in a creative way, says Marcin de Kaminski. And other than that, to buy bigger HDDs and to help your mom, your neighbour and your friends from work to fileshare! Over a period of three years, the pirate bay has grown from a small file-sharing site on a crappy ADSL-connection in Mexico to the world's largest distributor of culture and media of all kinds. Over a period of three years we have kept on ridiculing the threats from copyright advocates, and struggled to make as much as possible available to as many as possible. During the last two years, we've built a file-sharing empire the like of which the world has never laid eyes on, a cluster of web-pages and servers used by millions of people worldwide. During an ordinary work day the pirate bay has fifteen million visitors. Which other culture oriented site could even dream of comparing to that? Even though noone spreads more culture than we do, it is the film- and music-mob that are trying to close us down! Over the years we've received countless mail threats, all of which have been responded to with appropriate insults. Never the less, we've kept on going, without any interruptions. The internet is amazing! The users of the pirate bay, all of us together, send enough data to fill fifty DVD-R discs per second. Per second! That is an enormous amount of joy and pleasure. So what about the future? What will happen now, when the Swedish state and Hollywood are making out like a newly wed couple? We will keep on mocking their threats and ridiculous attempts at stopping us! The pirate bay will be even more international, decentralized and unstoppable! After Bodström and the police tried to attack us, help has poured in from around the world. Servers, bandwidth and economical contributions are offered without asking for anything in return. The people out there have seen how incredibly efficient bittorrent is. And the people out there are starting to grow weary of constantly being pushed around by the film- and music-mob. I am happy to announce today that The Pirate Bay is back up! After not much hard work everything that was up before the incident last Wednesday is back up again. This time we're firing with the big cannons and say "IN YOUR FACE, HOLLYWOOD!" So, you people at MPAA, Antipiratbyrån, Bush, Bodström, or whoever gave the order for this pathetic attempt at an attack – give it up, and stop messing with the internet! It’s a battle you will not win! Todays Demonstrations in Stockholm and Gothenburg both were very succesful. Many hundreds of pirates, file sharers, culture interesed people, integrity advocates and freedome advocates gathered to stand united and show what they thought. On orders from other interests they have tried to take down a complete infra structure, human communication. If we should not have a police state, file sharing must be permitted. End the preliminary investigation and stop fooling around with the internet. It is a battle that you can't win said Rasmus Fleischer from Piratbyrån. Fredrik Neij from The Pirate Bay got most applaused, that by the way showed up on the internet early on the Saturday morning. He spoke about how wry the politicians aimed when they started to attack the internet. - What is happening now is that we bring out the big cannons and say, "in your face, hollywood", he said. The demontrations in Stockholm was a collaboration between Piratpartiet (the Pirate Party), Ung Vänster (Youth "left" (socialist party, sorry for this bad explination), Liberala ungdomsförbundet (Liberal Youth association), Miljöpartiet (the Enviroment Party). In Gothenburg, the demonstrations was arranged by Piratpartiet (the Pirate Party), Liberala ungdomsförbundet (Liberal Youth association), Ung Vänster (Youth "left" (socialist party) and Grön Ungdom (Green Youth). Both demonstrations was well focused and aimed at its target, and eventual differences in the politics was for the day put aside. Piratbyrån would like to thank every one that took part in this for help and support. In Stockholm we would like to thank Ung Vänster (Youth Left), for support in the practical arrangements regarding the demonstration. Piratbyrån has nothing to to with the current attacks against the Swedish authorities homepages. We feel that this is a bad way to strive for a free and open internet. Furthermore we would never need to use these kinds of destructive methods, since everything is going so well for us anyway. Thanks and good bye, see you in the internet (on the sites that still works)! We demand every confiscated server to be returned, that all preliminary investigations ends, and the DNA-tests to forfeit. We also demand answers from the people responsible for the raid, in long term Thomas Bodström. Bring this: CD-Roms and a good mood. Leave the Sabers at home. Other organizers: Piratpartiet (the Pirate Party), Liberala ungdomsförbundet (Liberal Youth association), Ung Vänster (Youth "left" (socialist party, sorry for this bad explination), Grön Ungdom (Green Youth), and more. Gothenburg, Gustav Adolfs torg, 4.30PM. Org: Piratpartiet (the Pirate Party), Liberala ungdomsförbundet (Liberal Youth association), Grön Ungdom (Green Youth). Preliminary information, more info soon. Copyriot - Demonstration på lördag! This is an unofficial translation of the blog that is originally posted on http://piratbyran.blogspot.com . "Yes, I am happy with the fact that the police has started to work with this types of matters. At the same time, we here at Antipiratbyrån feel that the police have acted well towards the anti-copyright organization Piratbyrån, that runs the site. The Pirate Bay is more in the bottom of the chain, even if the harm the site has caused is very extensive." 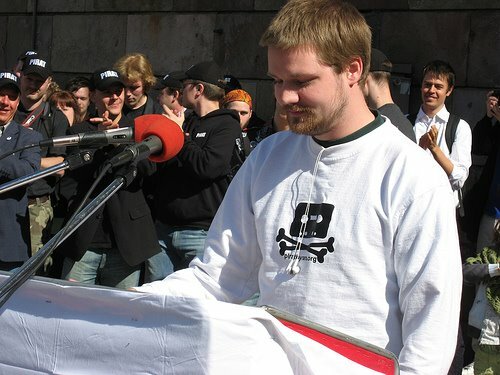 According to the police report yesterdays raid is targeted at ThePirateBay.org, but here Henrik Pontén says that the target is Piratbyrån, a place to think and make up plans and a forum for copyright critical matters. Should we interpretate this like when the Movie Association sees uncomfortable thoughts, then you make sure that an it-incompetent police does the clean up? What happened to the freedom of speech? And what is the purpose to confiscate servers belonging to hundreds of small buisnesses, associations and individuals, that has done nothing wrong at all? And what do the police need ThePirateBays legal representative DNA for? There is alot of questions that needs answers. Answers that only the responsible can give. But since the police only refers to the existing investigation and can therefore not make any statements thier top chief will have to give the answers. How much is the Freedom of speech worth in Sweden today according to Mr Bodström? I am sorry for the bad english, I would also like to point out that this is an unofficial translation of the blog that is originally posted on http://piratbyran.blogspot.com . Today the police had a raid against the Pirate Bay. The worlds largest Bittorent- tracker. For several years, the page has been a world central for people interested in culture from countries all over the world. Everything from home made essays to obscure japanese music to videos of the schlager finalie has been shared with the technique. On the servers, no illegal material has been stored. The torrent-files, links as people use to get connected and to download the desired material is containing text, that is certainly not protected by the copyright laws. At the meantime, a number of web pages located on neighboring server been confiscated. Here lies the biggest mistake from the Swedish police. The “Antipitarbyrån” has apparently tricked the police to simultaneously close down the site “pitratbyrån”. “Piratbyrån" Has been lobbying for an open debate regarding copywriting and patent matters. We are very upset over that the movie industry does not dare take the debate, but instead tries to fool politicians and police into criminalize a large portion of the Swedish population. Practically, ofcourse, this means really nothing for all the file sharing people around the world. There is literally thousands of other sites where you can get what you are after. People just change location. File sharing works like a Hydra, if you cut one head off, two more grows out! The Piratebay started at the summer of 2003 to highlight copy right questions. The pirate bay means that copy writing in many cases has played out its role and instead of protecting artists, really prohibits creativity and only “feeds” a few.